(Reuters) – World number one Garbine Muguruza fell at the first hurdle at the China Open yesterday with the Spaniard forced to retire due to illness during her first-round match against Czech Barbora Strycova. The Wimbledon champion looked sluggish throughout and was broken in the first game before losing the first set 6-1. She was trailing 0-2 in the second when she decided she could not continue. 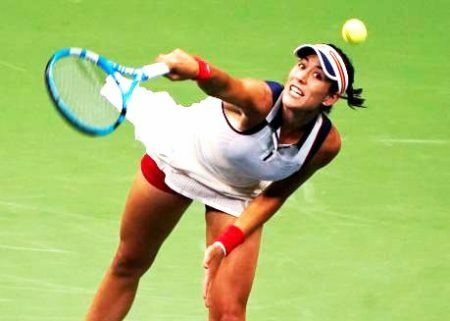 American qualifier Christina McHale served up another shock when she beat Sloane Stephens 6-3 6-0 to send the U.S. Open champion crashing out in the first round of a tournament for the second week in a row. Stephens, who is seeded 15th in Beijing, was eliminated in the first round of last week’s Wuhan Open by China’s Wang Qiang and was left lamenting another poor performance. France’s Alize Cornet eliminated former world number one Angelique Kerber 6-4 6-4 in the second round in an evenly contested battle that ended the German’s hopes of a first title since she won the U.S. Open in 2016. Kerber, the number 10 seed, battled hard from the baseline but was undone by Cornet’s deft touches at the net. Fifth-seed Caroline Wozniacki of Denmark bucked the trend of upsets with a 6-2 6-2 win over Russian Anastasia Pavlyuchenkova. Romanian and world number two Simona Halep’s match against Slovak Magdalena Rybarikova was moved to Wednesday after rain delayed play. Unseeded Belgian Elise Mertens pulled off a stunning comeback against Slovak eighth seed Dominika Cibulkova, winning 7-6(4) 6-1 despite trailing 5-0 in the first set, and faces Wuhan Open winner Caroline Garcia of France in round two. Peng Shuai also had to dig deep to get past American Shelby Rogers, but the Chinese edged out her opponent 7-6(3) 3-6 7-5 in an epic match lasting two hours and 48 minutes. American CoCo Vandeweghe progressed serenely into the second round with a 6-2 6-2 win over Croatia’s Donna Vekic, as did Russian Elena Vesnina whose Polish opponent, Magda Linette, retired after losing the first set 6-0.